While many Wake Forest students spent their spring break relaxing on vacation or within the comforts of their hometowns, a select group of students decided to engage in community service through participation in Wake Alternative Break (WAB). The WAB program was established 18 years ago and was inspired by the nationwide push towards civic engagement and active citizenship that was modeled and promoted by the Break Away program, a national nonprofit focusing on alternative breaks. The WAB director, Irving Zavaleta-Jimenez, reflected on the goal of the program to combine Wake Forest’s commitment to Pro Humanitate and a lifelong engagement in learning, even outside of the classroom. “The mission of WAB is to facilitate service in the community, connect participants to each other, encourage experiential learning around a social issue and inspire participants to return to campus motivated to positively impact their university, local, national and international communities,” Zavaleta-Jimenez said. These students led endeavors for civic engagement and experiential learning in one of the following five locations: Chicago, Ill.; Shenandoah, Va.; Otway, Ohio; New Orleans, La. and Warsaw, N.C. Each group was assigned to a location-specific community service project. In Chicago, students tutored elementary and middle-school children while volunteering at Casa Central, an organization focused on providing support and resources for the Hispanic community in the Midwest. The Chicago trip’s leader, freshman Rotchild Dorson, reflected upon the importance of providing opportunities for disadvantaged children through tutoring sessions, as well as the impact of this community service project. Meanwhile, another group of students focused on environmental conservation and the practice of mindfulness during the trip to Shenandoah. This group worked on restoring Shenandoah National Park through collaboration with the Virginia Department of Conservation. In Ohio, the students volunteered at Hurricane Run Farm, a small farm that utilizes sustainable farming practices to cultivate organic products. These students experienced organic farming and learned more about the importance of environmental sustainability. 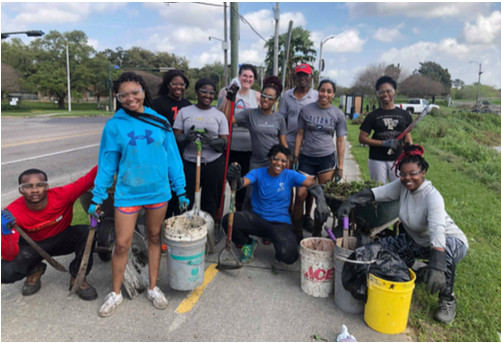 During the trip to New Orleans, students assisted with disaster relief through rebuilding houses and responding to natural disasters like Hurricane Katrina that ravaged the landscape and displaced many residents from their homes 14 years ago. These students partnered with the United States Recovery Project, which is a non-profit organization that provides assistance to communities and residents affected by natural disasters through volunteer-based, grassroots efforts to rebuild homes and to improve the quality of life for residents of the impacted area. Trip leader sophomore Caitlin Graham spoke to the benefits of volunteering in New Orleans. Students also worked toward disaster relief on a local level while rebuilding houses that were recently destroyed by Hurricane Michael on North Carolina’s coast. This trip was unique because Wake Forest alumni were afforded the opportunity to sign up for this WAB group and join current students working on this community service project. The WAB program leader commented on the importance of this opportunity for students to travel across the country in order to better serve other communities outside of the context of the Wake Forest and their academic classrooms. “It is my hope that students reflected on the service work that they were doing, whether it was disparities in education or which communities get most affected by natural disasters and why,” Zavaleta-Jimenez said.